A mayfly hatch is the grand finale in the year long seasonal play that returns annually for trout and anglers. This show begins the previous season with mature female mayflies, called spinners, laying their eggs on the surface of the water(video). The eggs shortly hatch into small larvae and quickly change into nymphs. 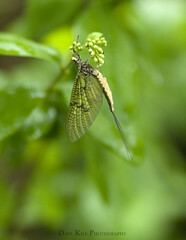 The nymph phase of the mayfly is the longest and will last just about one year. Different species of mayflies can be found in different parts of a stream. Some prefer the faster water and rocks, while others are only found at the end of pools in deep mud. During this time a nymph will grow and molt regularly. Molting is when the mayfly breaks out of it's old skin and a larger one is exposed underneath to protect it during the next growth cycle. During the final molting these leftover soft shells are referred to as shucks. The emergence stage out of the water can be a quick and dangerous time for these transitional nymphs. Trout can find and aggressively feed on these insects that normally may be hiding or burrowing at the bottom of a stream. Once ready to leave the water the hatch begins. The emerger swims to the surface film molts their skins and expose there wings. The cloudy, grayish wings they emerge with give them there name: dun. The duns sit on top of the water and prepare its wings for flight. On top of the film of a stream they ready their wings for flight. This can take seconds or minutes depending how fast the mayfly can take flight. During this phase, mayflies often can been seen in great numbers sailing down the stream with trout striking on an easy food source. Once the dun escapes the water, it will head for the trees for several days. While maturation occurs during this stage a dun may molt several more times until it becomes a spinner (Green Drake spinner aka Coffin Fly pictured left). As spinners they have no mouths to feed, male and female mayflies will seek each other out only to mate. The females will quickly lay her eggs back at the water starting the cycle over again. The cycle ends when the dead and dying mayflies drop to the stream. The spent wing spinner is the one final opportunity for tout to feed on the last stage of this great yearlong production provided by the mayfly. To learn and discuss more about mayflies on the site head over to the Hatch and Entomology Forum. Beginners can follow along and learn more in the Beginners Forum. A great online site to follow and get deep into the latin is Troutnut and his Aquatic Insects of our Trout Streams. A must read! !